Come join me on Sunday December 2nd, 2018 in Casselman for the 6th Annual Santa Walk & Run! 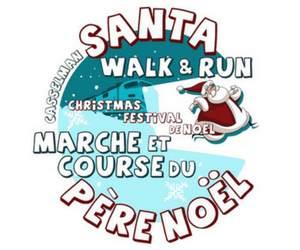 The Santa Walk & Run is an annual event that takes place during the Casselman Christmas Festival. This event attracts more than 350 participants who will run or walk distances of 3.5 km, 5 km or 10 km in full Santa Suits. Santa suits are included in the registration fee. The objective of this annual event is to promote the pleasures of running and walking, as well as its health benefits. Profits from this event will benefit the HGH Mental Health and Addiction Regional Program that includes three satellite offices: Casselman, Clarence-Rockland and Hawkesbury. For all details, visit our page Santa Run. For information on the festival, visit Casselman Christmas Festival. For information on mental health programs at the Hawkesbury and District General Hospital, visit HGH Mental Health and Addictions. To help the Foundation, visit Become a volunteer.